Acai Roots, a lifestyle brand, top supplier of natural and organic Brazilian style super food acai products, today announced its entire product line has recently received organic certification from CCOF (California Certified Organic Farmers). Through the organic certification process, Acai Roots expects to fully validate its products and processes to consumers who embrace the organic lifestyle. "Becoming an USDA certified organic brand was a natural course for us. We are very pleased to announce this achievement and extremely happy to see such a positive feedback from our customers and business partners," said Igor Pereira, Acai Roots Co-founder and CEO. "The USDA organic certification is a way to show our commitment to top quality products," added Pereira. 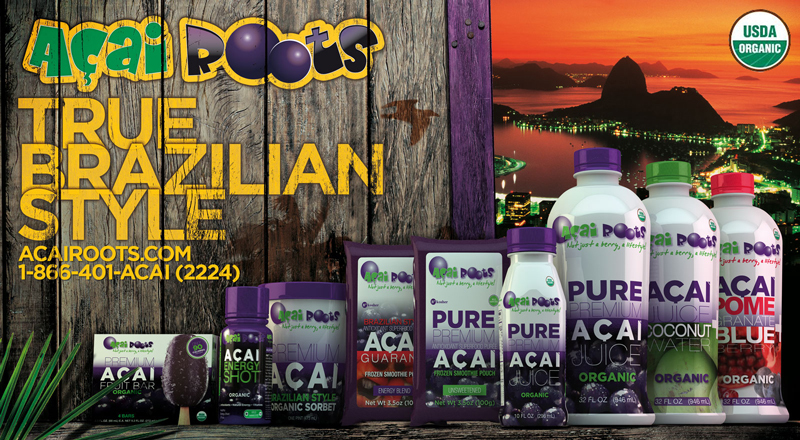 Acai Roots products are made with natural and organic acai berries, all wild-harvested from the state of Para, where Brazil produces its "cream of the crop" acai. The company offers a full line of acai berry products, such as: frozen smoothie pouches, frozen sorbet and fruit bars, organic juices, acai powder, and more. The products carrying the USDA organic seal on their labels are already available for purchase in natural food stores nationwide and through the company's website. Have you ever missed something from your childhood? Something that was phenomenally good for you, and you knew it? That was the feeling that gripped several Brazilian expatriates one day in 2005. They had just finished playing soccer in San Diego. "We had all grown up with acai, and we started talking about how great it was in Rio with that active lifestyle - the Cariocas of Rio are famous for having an active lifestyle and a balanced diet, and acai is a big part of that. That was the missing piece: the acai. There were companies bringing it to the U.S., but it just wasn't what we grew up with - it wasn't fresh. So we decided to start Acai Roots™, and do it right." Today Acai Roots™ offers a full line of delicious and healthy acai berry products including organic acai sorbet, organic juices, smoothies and supplements. All formulated to exacting standards by Brazilians who were born and raised on a healthy diet of acai. For more information, please visit http://www.acairoots.com. You can also Like Acai Roots™ on Facebook or follow us via Twitter @acairoots.